God is all about family. In Ephesians 3:14-15 Paul the Apostle says... 14For this reason I bow my knees before the Father, 15from whom every family in heaven and on earth is named, (ESV). 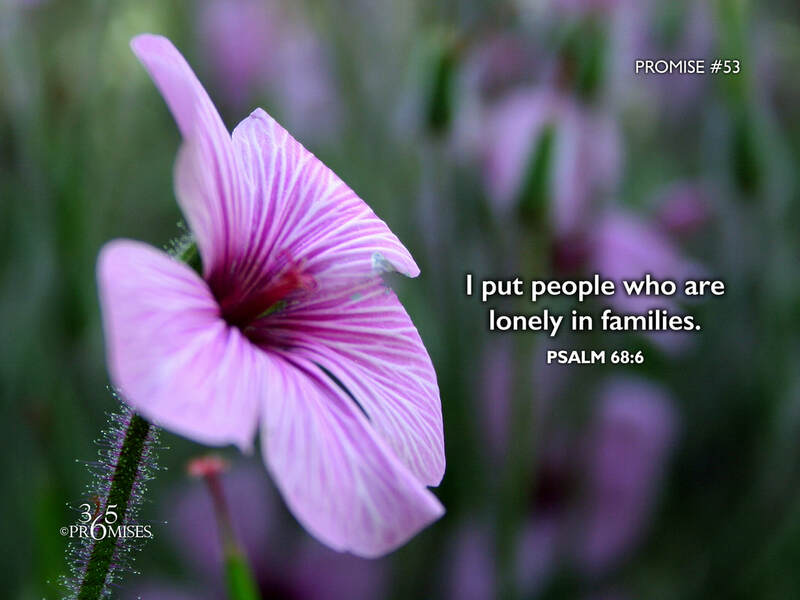 God understands that we were created to be in families, so in today's promise, we read how God puts people who are lonely in families. I believe His heart is that we would experience family life on earth through brothers and sisters in the kingdom of God as well as family life in heaven. In John 8:35, Jesus tells us... Now a slave has no permanent place in the family, but a son belongs to it forever. (NIV) Whether we have had a good family system on earth or not, we have a permanent place in the family of God where we will belong forever. If you are struggling fitting into your natural family, be encouraged to know that you belong to an amazing supernatural family where we can call each other brothers and sisters because we have the same Heavenly Father. God places the lonely in families. That is good news for each and every one of us!